It’s about time I introduced you to my family’s mashed potato recipe! Meet the only mashed potatoes I ever want to eat. Every Thanksgiving, my mom opens up a 1970s church cookbook called “Thyme to Cook” to make them. 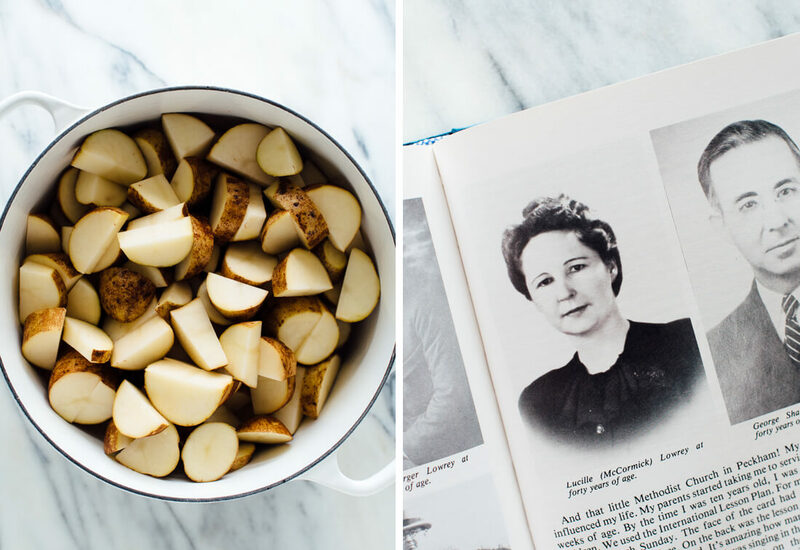 They’re called “Refrigerator Potatoes” and the recipe cites three authors, with my great-grandmother Lucille listed third. I call them Lucille’s mashed potatoes, so that’s what I’m calling them today. For several years now, I’ve contemplated how to offer a “Cookie and Kate” version of these mashed potatoes (as in, a lighter version). But why mess with a good thing? We’re talking about a traditional holiday recipe that I enjoy twice a year, on Thanksgiving and Christmas. Let me tell you, these mashed potatoes are worth it. Lucille’s mashed potatoes are creamy and dense, tangy and irresistible. They are all of those things. Here’s what they are not: light, fluffy, milky or watery. Lucille’s potatoes are everything that I want mashed potatoes to be! Nothing more and nothing less. This year, I decided to share recipe as is, with some of my notes added for clarity. I’ll breakdown the ingredients, too. 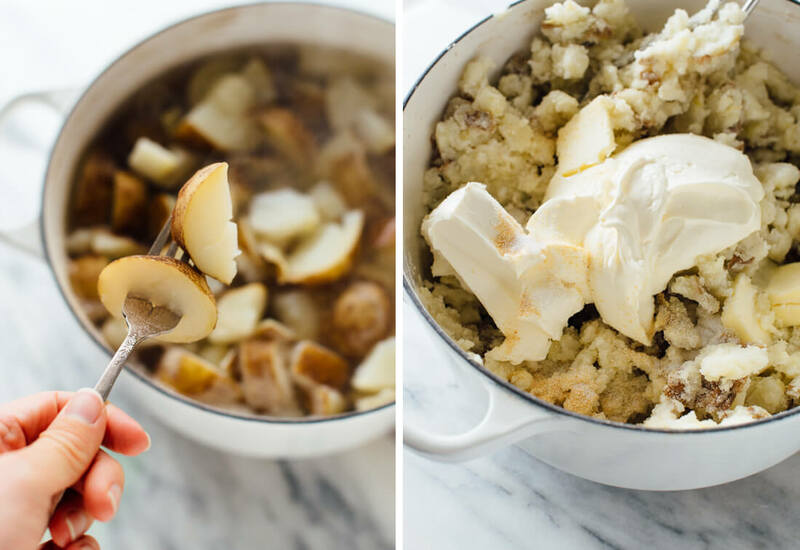 Ready to make the best mashed potatoes?! Wait, can I tell you a little bit about my great-grandmother Lucille? She was a special lady. Brilliant, too. Lucille was the oldest of six sisters. 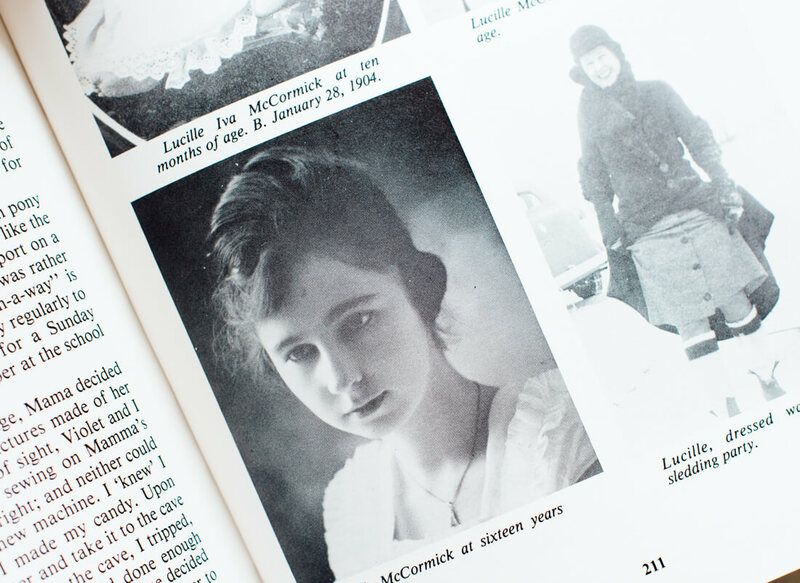 She graduated from high school at the age of 16 and college at 20, in 1924. Before the internet existed, she immersed herself in my family’s genealogy and wrote an entire book about our family’s history. She printed it for future generations, complete with a pull-out family tree. The names date back to Switzerland in the 1300s. Lucille was really something else. She was older when I was born, but I remember her big laugh and the M&M’s she always kept in a fancy container on her coffee table. Let’s break down the ingredients and methods used to make Lucille’s mashed potatoes. First up? The potatoes. My family always uses Russet potatoes, which is how I like these mashed potatoes. They taste like the inside of a baked potato. I’m into that. Rumor has it that Yukon Golds are creamier, but Adrianna says they take longer to cook and break down. Next up: To peel, or not to peel your potatoes? 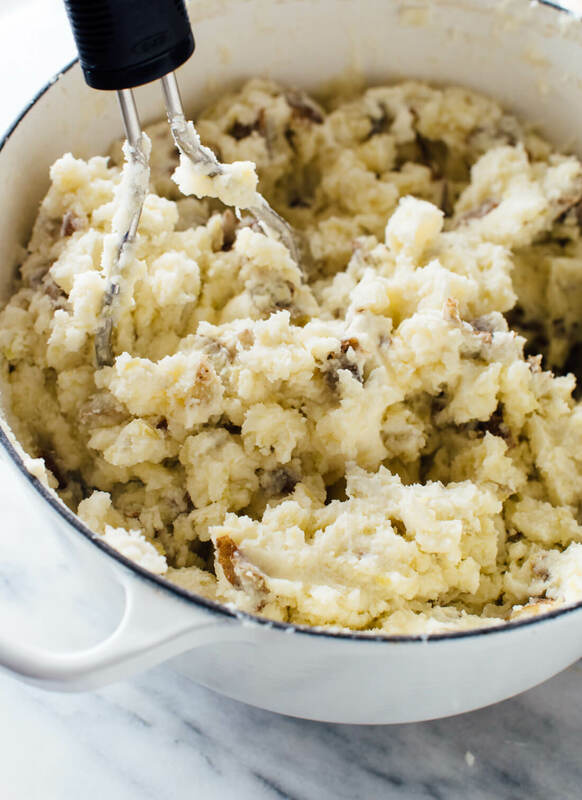 My mom and grandma always peel the potatoes before making these mashed potatoes. I love the flavor of potato skins and I like some texture to my mashed potatoes, so I didn’t peel mine. I’m also lazy. Peel your potatoes if you want smooth, skin-free mashed potatoes. Do you like some texture in your mashed potatoes? For some texture (shown here), just use a potato masher and mash just until the potatoes are as chunky or creamy as you’d like them to be. Or do you prefer smooth mashed potatoes? Be sure to peel your mashed potatoes before cooking. Then, either keep mashing with your potato masher, or use a hand mixer or stand mixer to blend them until smooth. 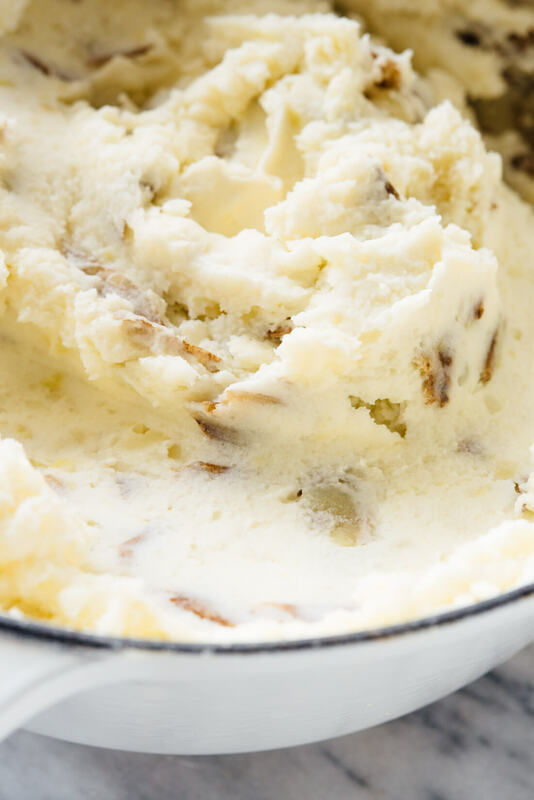 For ultra super smooth mashed potatoes, use a ricer to process the potatoes and then a mixer to blend them until creamy (see Adrianna’s method here). Once your potatoes are mashed, stir in the remaining ingredients. 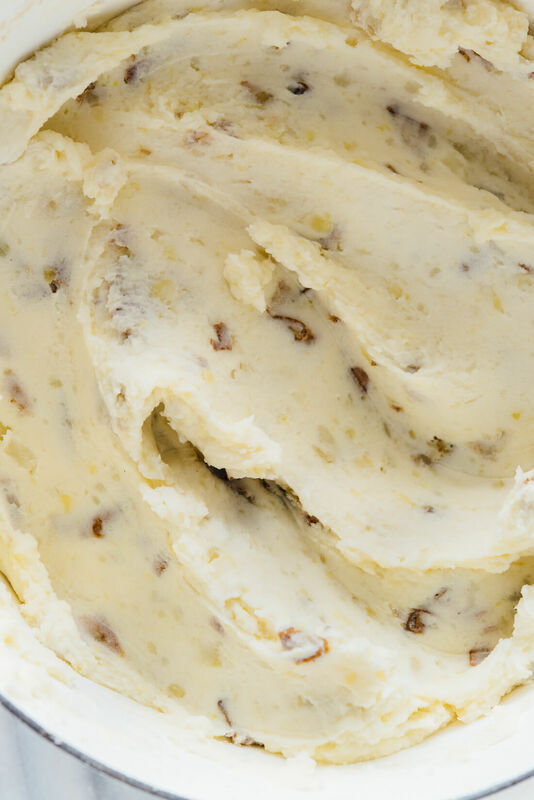 Cream cheese and sour cream offer lots of flavor and extra creaminess (you can used reduced fat varieties if you want). The mashed potatoes aren’t complete without a little butter and some salt. Lucille’s secret ingredient? Onion powder. It gives these mashed potatoes a subtle, gimme-more-of-that quality. Don’t skip it. 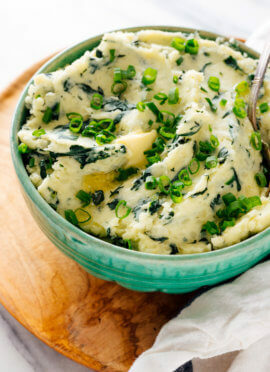 Once everything’s stirred in, these mashed potatoes are delicious and ready to eat right away. However, you can let them cool and store them for later. Reheating them in the oven seems to concentrate the flavors even more, and I find them a little more irresistible after they’re baked. Holidays are hectic, so choose whichever option is most convenient. To serve, you can dress them up with a garnish (or not). My grandma sprinkles a ground paprika on top for color (not the hot or smoked kind). You can also do finely chopped chives, or parsley, or just a pat of butter. They’re amazing no matter how you serve them! Now that I’ve made them for myself, I must say—mashed potatoes are really easy to make. Real, homemade mashed potatoes or bust! Craving something different? Don’t miss my savory mashed sweet potatoes. 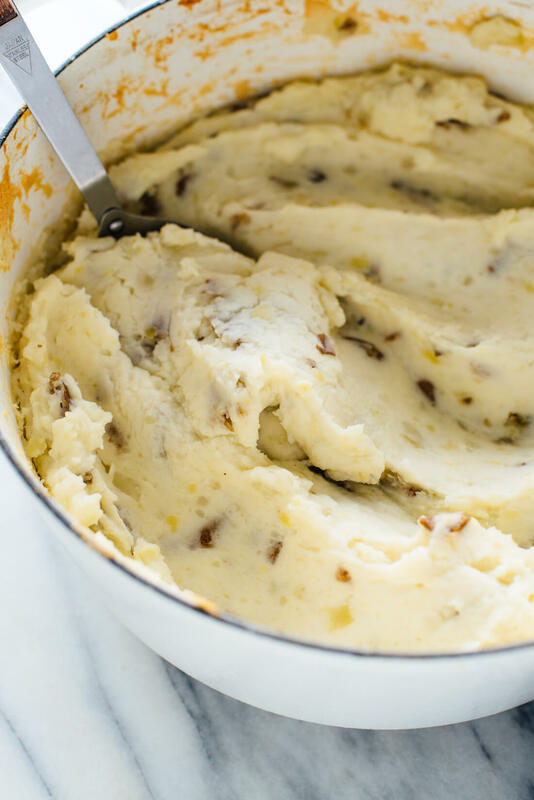 Please let me know how these mashed potatoes turn out for you in the comments! I hope they become your family’s favorite mashed potatoes, too. My family’s favorite mashed potatoes recipe! These mashed potatoes are creamy, rich and tangy, thanks to the cream cheese and sour cream. You can make these mashed potatoes ahead of time, too (see the final step for details). Recipe yields 8 large or 12 medium servings; I believe you could successfully halve the recipe for a smaller crowd. To prepare your potatoes, you can either scrub them clean and leave them unpeeled (like I did) or rinse and peel them (for smooth, skin-free mashed potatoes). Then cut the potatoes into even chunks about 2” in size (see photos). Place the potato chunks in a large Dutch oven or soup pot. Add 1 teaspoon of the salt, and enough water to cover the potatoes by 1 to 2 inches. Bring the mixture to a boil over high heat. Continue cooking, reducing the heat as necessary to prevent overflow, until the potatoes are easily pierced through by a fork, about 10 to 15 minutes. Carefully drain off all of the water and return the potatoes to the pot. Mash the potatoes until they reach your desired consistency (I like mine a little chunky, but you can mash them completely smooth if you prefer). Add the cream cheese, sour cream, butter, the remaining 2 teaspoons of salt and the onion powder. Stir until everything is mixed together evenly. You can serve the mashed potatoes immediately at this point, with garnishes of your choice. If you’re making these mashed potatoes in advance, transfer them to a casserole dish with a lid (my Dutch oven is oven-safe so this was unnecessary). Smooth the top, cover, and store the mashed potatoes for up to 3 days in the refrigerator. To serve, preheat the oven to 350 degrees Fahrenheit. Bake the mashed potatoes, covered, until warmed through, about 30 to 35 minutes. Serve with garnishes of your choice. Leftover mashed potatoes? They will keep well in the refrigerator, covered, for up to 4 days. *Why buy organic? Potatoes are #12 on the Dirty Dozen list, meaning that conventionally grown potatoes are generally high in pesticide residues. “Light” option: I used full-fat cream cheese and sour cream, but my mom uses reduced fat and I honestly can’t tell the difference. Make it dairy free/vegan: I haven’t tried, but I think these mashed potatoes would be great with 1 ¾ cups vegan sour cream (see my cookbook, page 217) in place of the sour cream and cream cheese. You can omit the butter or stir in a tablespoon or two of extra-virgin olive oil in its place. Recommended equipment: I made these mashed potatoes in my 5.5-quart Dutch oven, which was just big enough, and used my OXO potato masher (those are affiliate links). There is vegan cream cheese. Do you still recommend only using the vegan sour cream. Personally, I would stick to the real thing to get everything out of this recipe. :) But if you are vegan and need the substitute, then I say sure. Thanks, Jeannie! I am curious why you use Russet potatoes? Maybe there is an advantage to using Russet potatoes? I have always used Yukon Gold. Russet potatoes are often used to make mashed potatoes. It doesn’t always have to be Yukon Gold. Lucille sounds like a truly wonderful lady! I am always looking for new mashed potatoes version and this sounds fantastic! She was pretty neat! Let me know what you think once you try them. Kate these sound wonderful. I am going to give them a try for Thanksgiving. Thank you for passing the recipe on. Welcome! Let me know what you think, Terri. Enjoyed hearing about your great-grandmother; I wanted to hear more. She indeed sounds like an amazing trailblazer. Will definitely try her potatoes. Thank you for sharing her and her recipe. Thank you! She was a pretty great woman. Let me know what you think about the recipe once you give it a shot! That’s a great tip! Thanks, Tony! these with every turkey dinner. She cited “Star Weekly” as the source of the recipe back in the early 70’s. I have been making them for years, the only difference being our recipe calls for onion salt. Quick sidebar, I made these for a potluck Thanksgiving dinner years ago. One woman tried them and said, OMG, I want to make love to these potatoes. Hi Char! The original recipe called for onion salt. Maybe one of the ladies listed by the recipe found it in Star Weekly! Thank you for solving that mystery. And haha—I can see where that lady at your Thanksgiving was coming from. Ah,ah.. I though I was the only one who did not like most mashed potatoes :). I had requested that you share this recipe after you mentioned it in a previous post. I didn’t really think that you would. :) Thanks for sharing! I can’t wait to try them! Lucille sounds like a wonderful and amazing woman! That’s quite a genealogy she recorded, very rare to go that far back! I was wondering if these mashed potatoes are good with gravy, or if the cream cheese and sour cream get in the way of that. They do sound yummy no matter what! I like them as is because they are so good! I also stay away from gravy being vegetarian. But you can try it! This is great and I really appreciate that you posted it as is without any healthified tweaks – some things just need to be honored and enjoyed as an occasional indulgence! My grandmother also used good old fashioned research to trace our genealogy back to Ireland – we always joked she had our family traced back to Adam and Eve. But her candy dish held circus peanuts! :) I look forward to trying this recipe soon! Let me know what you think once you do try it! I make a version of this that’s vegan – with Tofutti cream cheese (no sour cream, though). So I think you can just sub out vegan versions of everything and it would be amazing! Glad to hear it! Thanks for confirming, Rachel! I think that mashed potatoes are my favorite Thanksgiving food, yet I have never seen them made with cream cheese. I can tell you that I like where it is going with that! That looks beautiful and pretty sure I am going to have to try this. Cream cheese is key here! Let me know what you think once you try them. Thanks for commenting, Ben! Cute post. Your great grandma sounds like she was a cool lady and way ahead of her time. Haven’t made the potatoes yet, but plan to with holidays coming up. Love ya C + K.
She was pretty great! Let me know what you think once you give them a try. Thanks, Barbara! I have to say: as soon as I saw the picture of your grandmother, I knew this recipe would be amazing. And it is! I’m so looking forward to making Lucille’s Mashed Potatoes for our Friendsgiving Dinner. It’s a fantastic idea to add sour cream and cream cheese. It’s just smart. Thanks for sharing your family recipe with us. Thank you! I hope you love them as much as I do. Love the story about your great-grandmother! Made a half batch last night as a trial run prior to Thanksgiving. Left the skins on. Super easy and absolutely delicious! This is going to be a weird question, but I’ll ask anyway in case you have any thoughts! I am planning on making these for Thanksgiving, and one member of the crowd is on kidney dialysis. To make the potatoes dialysis-friendly, they have to be boiled, drained, and then boiled again before mashing. Do you foresee this causing any issues? Will they absorb too much water? Any thoughts are appreciated! Hi Rebecca! I’m not sure to what extent that will effect the potatoes. I bet the mashed potatoes will still turn out well, though! Just made them! The second boil didn’t hurt them a bit, and I will never make another mashed potato recipe. They are amazing! I can hardly wait for the feast tomorrow! My family has also been making these potatoes (with the onion salt) for generations. Small world! We call them Party Potatoes. I love them! Actually, Thanksgiving and Christmas were the only holidays we didn’t make them for– I guess the women in my family thought they were too rich with all of the other food that’s served at those times. I made them last year for Thanksgiving myself, and they were wonderful! Classic traditional family recipe for sure! Thank you so much for your review, Liz. Omg, I hate mashed potatoes normally, and these are life changing great! I followed the recipe exactly (may have added a smidge more onion powder and cream cheese), and they are heaven! Just in time for thanksgiving – thank you!! Good stuff. I don’t usually have onion powder, but bought some for this recipe and thought it was a worthwhile addition; it gave the mashed potatoes more savory depth. Onion powder adds a nice touch, I agree! Thank you for trying it and for your review. I appreciate it! Made these for Thanksgiving. No complaints. Actually they were very good and the perfect base for a loaded potato soup on the day after. My family usually makes a similar recipe for Thanksgiving, but with peeled potatoes and without onion powder. I followed your recipe this year and the change was well-received. I thought the onion powder gave them great flavor, and felt a bit more virtuous knowing the peels were in there. 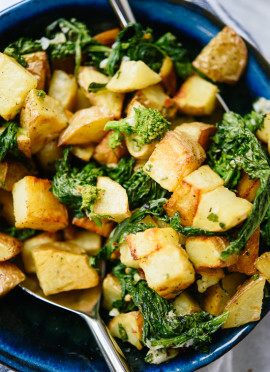 These potatoes are fabulous! I especially love that I can make them ahead, a day or 2 and avoid the last minute rush. Not being a crazy-for-mashed-potatoes gal, I loved the flavor. The onion powder is a great addition, adding to the complexity of flavor but in a subtle way. Thank you, Kate and furry friend, for giving me this easy, go-to recipe! P.S. Using organic Yukon Gold potatoes, it couldn’t be simpler to leave the skin on. A few slices here and there to cut them up and then off to the pot they go, wow! Glad to hear that, Susana! They are so so good. :) I appreciate the review! Sounds easy and delicious, I am going to make these mashed potatoes for Christmas dinner. Let me know what you think, Teri! Well, thank you Susan! I love these mashed potatoes so I am happy to hear they were a big hit with your family too. Have a happy holiday season! You said that you don’t eat gravy since you’re vegetarian. I am also a vegetarian, but I eat gravy and love it. I fix it with coconut oil, baking mix (Granny Bundt) and either milk or water. Love your recipes and your blog. 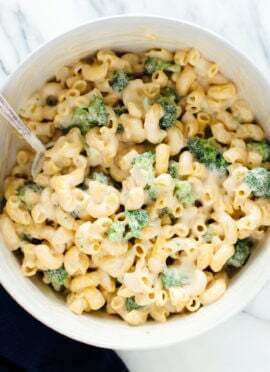 I make the same recipe but with Garlic and Herb cream cheese and no onion powder. Very yummy!! I’m going to try it with the onion powder next. Thanks for sharing! Let me know how you like it! Thanks, Deb. 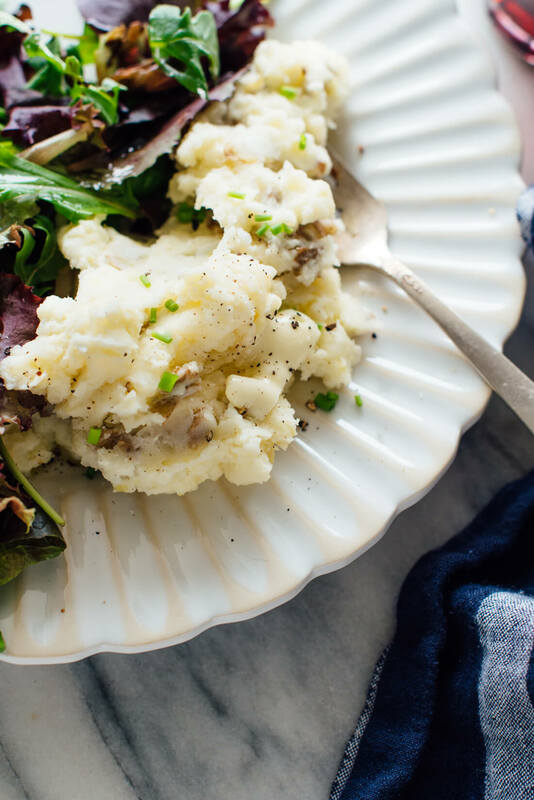 These mashed potatoes are perfection! I love the consistency and they are so flavorful and tangy. I made them last year for the holidays and will make them every year from now on. Thank you!!!! I’m glad you think so! I really appreciate you taking the time to comment and review, Courtney. It was a Cookie and Kate – inspired Thanksgiving this year, and we loved this dish. Kept on loving it on days two and three also. That sounds like fun! Thanks for sharing Cookie + Kate with your loved ones. I appreciate the review, Anthony. I’ve been making a variation of this recipe for over 35. I found it in a lovely book called the Canadian Living Christmas Book. It is virtually the same except it calls for a cup of chopped green onions, a half cup of minced fresh parsley and a pinch of marjoram. I use lower fat cream cheese and sour cream so it’s less rich. For Christmas, I make the mashed potatoes a week ahead of time and freeze them. Then I defrost them for 24 hours. I reheat them in my slow cooker to free up oven space. That’s awesome, Emily! Thanks for coming back to review.